Fresh from a full redesign, the Toyota RAV4 is back for the 2019 model year and this time with some exciting updates. Not only does the new model receive a new look and features, but Toyota has also refined the engine options for both the gasoline-powered and hybrid RAV4 models. To start, all 2019 Toyota RAV4 Hybrid models are standard with a new All-Wheel Drive with Intelligence (AWD-I) technology. 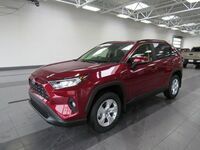 Unlike the Hybrid model, the gasoline-powered RAV4 is not standard with all-wheel drive but is available with a Dynamic Torque Vectoring All-Wheel Drive with Rear Driveline Disconnect for select trims. But aside from the difference in engines, what sets these two new models apart? At the end of the day, it really comes down to the features and personalities of each model. To best showcase the two RAV4 SUVs, we have put the two side-by-side here. See the new 2019 RAV4 at Le Mieux Toyota today! Another major difference between the two SUVs are the features inside the cabin. 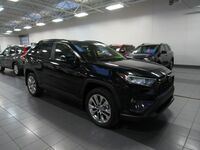 The 2019 RAV4 Hybrid is standard with an integrated backup camera, dual-zone automatic climate control, Sirus XM Satellite Radio, a 4.2-inch multi-information display and halogen projector beam headlights. There are also ECO, Sport and EV driving modes for an even more dynamic driving experience. 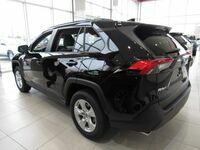 The gasoline-powered 2019 Toyota RAV4 LE, on the other hand, is standard with LED headlights, power-folding outside mirrors, remote keyless entry, a climate control system, an integrated backup camera, an Entune 3.0 system, Toyota Safety Connect, Blind Spot Monitor and much more. A multi-terrain select two-mode system with Mud & Sand, Rock & Dirt modes is also available. We invite you to compare the two models for yourself with a test drive at Le Mieux Toyota. Our award-winning experts can answer any questions you might have and can help you find the perfect vehicle for your budget and style. Stop by and see us today!